Always put the cold water in first, then add the hot, so that if an accident happen, such as a bath being upset or a child falling in, scalding will not result. Also never add hot water while the child is in the bath; take out the child first, and then pour in the water. The neglect of ' these simple rules has lost the lives of hundreds of infants. If for any reason the thermometer cannot be used, the nurse must roll up her sleeve and test the temperature with her elbow, not hand, the former being far more sensitive, and, therefore, more reliable. When everything is in readiness, the nurse must roll up her sleeves, tie on an under-apron of macintosh to prevent damping her dress, and over that a long, full apron of good thick flannel. 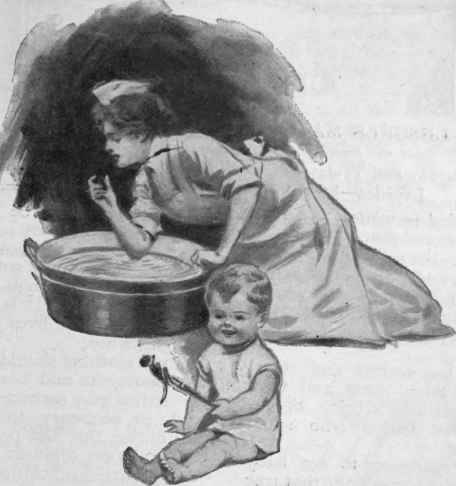 Air and warm this before use; a cotton apron is too chilly and uncomfortable on which to lay an undressed baby. Unless a hammock-bath is used, lay a square of flannel folded thickly, or a Turkish towel, in the bath or basin. This is much cosier for baby than to rest upon a hard, slippery surface. Undress the child by pulling the little garments off the feet, not over the head. The latter method is far too rough for a sensitive child, often making it start and shrink nervously. Throw a fold of the warm apron over baby's body, and gently sponge and soap the head, taking care that the water does not trickle into his eyes or ears, as this often makes him cross at the start. Children amount of soap. Next lower the baby very gently into the bath, supporting his head and spine firmly along the left arm and holding him with the left hand. Even with care some sensitive children will shiver and gasp from ' the shock of the water, while others take to it like young fish. Next sponge well all over, streaming the water gently all over the body, as this acts like a shower-bath, and has a bracing effect. Rinse the head carefully. Now lift baby out on to the apron, cover him over with a soft towel, and begin to dry his head and face, working downwards to his toes, covering up each part as soon as possible. Dry the skin more with soft little pats than rubbing, and be very careful that all the creases and folds of the little body are perfectly dry, especially such parts as are liable to chafe. If any redness is noticeable, apply a little boracic ointment, or pure vaseline, and no powder. Many nurses keep the lower limbs rubbed with vaseline or boracic ointment, not powdered, as powder cakes when moistened, and causes chafing. The eyes, mouth, ears, and nostrils each need a special toilet. Some people prefer to do these before the bath, others after it, and perhaps the latter plan is best, as this part of the proceedings usually upsets baby's temper. Put one table-spoonful of boracic acid lotion into a cup or basin, add to it three tablespoonfuls of warm water. Have ready some small wads of absorbent cotton-wool. Wrap one of these pieces of cotton-wool round the finger, dip it in the lotion and very gently wipe all over inside the child's mouth, taking great care not to rub in the least roughly, as the mucous membrane is very tender, and inflammation and ulceration are easily set up. Once a day is quite sufficient for cleansing the mouth if proper food is given and the teats of the feeding-bottles kept scrupulously clean. The old-fashioned honey-andborax mixture is now condemned by most medical men. For infants the best plan is to dip a piece of clean cottonwool into the lotion. Let one drop fall gently into each cye, then wipe it carefully with a second piece. Do each eye separately. If the eyes are neglected ophthalmia may result. Cleanse these night and morning with a little swab, made by tying a piece of cotton-wool on to a headless match, and, after dipping it in the lotion, very gently remove any dry mucus blocking the air passages. This is a more comfortable and effective method than using a hard, spiral twist of towel or handkerchief. If from any cause the nostrils are much blocked, the cotton-wool can be dipped into a little olive oil to soften the obstruction. Every bit of cotton-wool must be burnt after use, and a clean bit taken for each part. The ears need the most careful washing and drying; nothing of any description, much less hard twisted corners of towels, or, worse still, hairpins, must ever be pushed into them, or the "drum" may be ruptured or acute inflammation set up. A soft sponge and towel are alone suitable to use. Dry the ears very carefully, otherwise earache and gatherings may result, which may end in deafness. After a light powdering all over, the last process is to give baby a brisk but very gentle rubbing and patting all over with the hand, which must be dry, warm, and ringless. If the hand is at all rough lubricate it slightly with a little olive oil. Use a light, caressing movement, especially over the abdomen and spine. This species of massage, if properly performed, is often of the greatest good to weakly, fretful, little mortals, and they greatly enjoy it. Next robe baby in clean, warmed garments, and he is ready for his breakfast, to be followed by his morning nap.